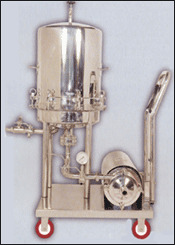 The unfiltered liquid is fed into the filter under positive pressure, where liquid travels in downwards direction and finds its way through opening on sides of the Filter Plates. As the liquid pressure increases, the Filter media holds the foreign particles and allows only clear filtrate to pass through the central channel formed by interlocking pressure cups to the outlet. Filtration is continued until the cake holding capacity of the unit is reached or until the filtrate rate becomes too slow owing to cake resistance. •	Horizontal Plate Filter Press is enclosed construction, preventing evaporation, oxidation, leakage and fumes escaping from product. •	Filter plates are available in two sizes. Deep plate for large percentage of cake holding capacity and Shallow plate for small percentage of cake holding capacity. •	The horizontal filter plate and even thickness of cake, prevents the cake dropping as well as cracking, thus assuring better filtrate quality. •	The Filtration area and cake holding capacity can be increased or decreased according to requirement. Diameter of Plate No. OF Plate Filterig Area M2 Cake Holding Capacity Ltrs Capacity Ltrs/Hr. VISHWA ENGINEERING has been the leader in manufacturing machines for pharmaceuticals, chemicals food, Drugs, Dairy & Allied processing for Three decades (EST: 1984). Tailor made product as per customer demand. Standard product available in stock for any urgency. Annual rate contact for Traders, Dealers and machine manufacturer. 31, R.J.Compound, Alwin Nagar, Kherani Road, Sakinaka, Mumbai, Maharashtra, India. 400 072.